Explanation: Today the solstice occurs at 23:03 Universal Time, the Sun reaching its southernmost declination in planet Earth's sky. Of course, the December solstice marks the beginning of winter in the northern hemisphere and summer in the south. When viewed from northern latitudes, and as shown in the above horizontally compressed image, the Sun will make its lowest arc through the sky along the southern horizon. So in the north, the solstice day has the shortest length of time between sunrise and sunset and fewest hours of daylight. 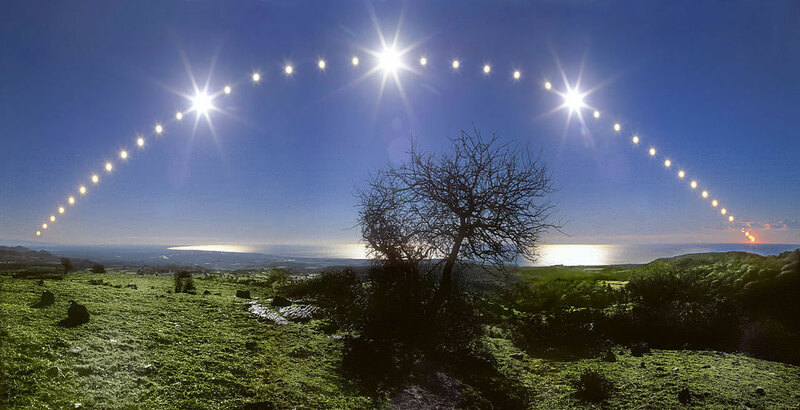 This striking composite image follows the Sun's path through the December solstice day of 2005 in a beautiful blue sky, looking down the Tyrrhenian Sea coast from Santa Severa toward Fiumicino, Italy. The view covers about 115 degrees in 43 separate, well-planned exposures from sunrise to sunset.